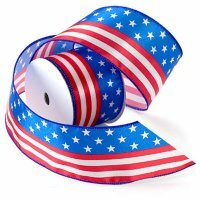 Stars & Stripes is a 2-1/2 inch wired ribbon in a bold American flag print. Add patriotic flair to your Independence Day craft or decoration and let the Stars and Stripes proudly wave! The Ribbon Diva offers decorative ribbon from Morex Ribbon at wholesale pricing. Our collection of fine ribbons include: satin, sheer, grosgrain, double ruffle, taffeta, French wired, curling ribbon, velvet, and much more.